Interest in marine dissolved organic matter (DOM) is very high because it plays an important role in oceanic and global carbon cycling, which in turn impacts weather. Understanding the processes involved in the transformations of carbon, phosphorus, nitrogen, and other major elements in the oceans has been a primary goal of marine biogeochemists and oceanographers over the past decade. This book, in 16 chapters with over 170 figures and tables, reports on the major advances in this area by a distinguished group of international chemical and biological oceanographers. Additionally, it focuses on the role of DOM in elemental cycling - where the greatest informational need currently exists. Students and academic and professional scientists in oceanography, chemistry, and marine ecology. 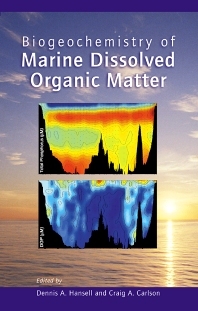 Why Dissolved Organics Matter. Analytical Methods for Total DOM Pools. Chemical Composition and Reactivity. Production and Removal Processes. Dynamics of DON. Dynamics of DOP. Marine Colloids and Trace Metals. Carbon Isotopic Composition of DOM. Photochemistry and the Cycling of Carbon, Sulfur, Nitrogen and Phosphorus. Chromophoric DOM in the Coastal Environment. Chromophoric DOM in the Open Ocean. DOM in the Coastal Zone. Sediment Pore Waters. DOC in the Arctic Ocean. DOC in the Global Ocean Carbon Cycle. Modeling DOM Biogeochemistry. Hansell was raised in the San Francisco Bay Area, receiving a bachelor’s degree in biology at Humboldt State University. He was awarded a masters degree in fisheries science at Auburn University and a doctorate in oceanography at the University of Alaska Fairbanks in 1989, with a focus on the nitrogen cycle of subarctic seas. He was awarded postdoctoral opportunities at the Univ. of California, Santa Cruz and at the Univ. of Washington, then built a research laboratory at the Bermuda Institute of Ocean Science (BIOS). In 2001, he was appointed Professor at the Rosenstiel School of Marine and Atmospheric Science (RSMAS) at the University of Miami. Hansell’s research on dissolved organic matter, particularly the cycling of carbon through that pool, has been strongly supported by the U.S. National Science Foundation. Research opportunities arose through his involvement with the U.S. Joint Global Ocean Flux (JGOFS) and the World Ocean Circulation Experiment (WOCE) projects. These projects led to research in all of the major ocean basins and several marginal seas. His laboratory has supported oceanic time-series, process studies and ocean basin-spanning surveys (long lines). He continues in these studies today, including the Repeat Hydrography project organized by U.S. CLIVAR. He has published >100 journal articles and chapters on ocean biogeochemistry. Steering Group and chairman of the Division of Marine and Atmospheric Chemistry at RSMAS. He presently serves as a member of the International Scientific Advisory Committee, Centro De Investigación En Ecosistemas De La Patagonia, Coyhaique, Aysén, Chile, as a member of the Board of Trustees of BIOS, and as a member of the Advisory Board, Florida Center for Ocean Sciences Education Excellence (COSEE). He was elected to give the 2014 Sverdrup Lecture by the Ocean Sciences Section of the American Geophysical Union. Carlson grew up in New England and received his Bachelor’s degree from Colby College (Waterville, ME) in 1986 and his Ph.D. from University of Maryland’s Horn Point Laboratory in Cambridge MD in 1994. His graduate research focused on microbial ecology and how microbes process dissolved organic matter in open ocean systems. Much of his graduate work was conducted in the Sargasso Sea in conjunction with the Bermuda Atlantic Time-series Study (BATS) site. He moved to the Bermuda Institute for Ocean Science (BIOS) in 1994 for his post doctoral work where he focused on the focused on the biogeochemistry of dissolved organic matter in the oceanic systems of the Southern Ocean and the North Atlantic Subtropical Gyre. In 1996 he joined the faculty of BIOS where he initiated programs in microbial oceanography. In 2001 Carlson accepted a faculty position at the University of California, Santa Barbara where he is now a full professor. Carlson’s research interests, supported by the U.S. National Science Foundation, continue to be shaped by an interdisciplinary blend of marine microbiology and organic biogeochemistry. Specifically his research has focused on the role marine microbes play in the cycling of elements through oceanic dissolved organic matter (DOM) and the biogeochemical significance of DOM in the marine carbon cycle. His earlier work demonstrated the importance of DOM in ocean biogeochemistry and carbon export in the ocean and subsequent work showed how microbial processing of DOM affects its quantity and character through time and space. In 2002 received the American Geophysical Union’s Ocean Science Early Career Award for his contributions towards the understanding of the ocean carbon cycle. Carlson currently serves as Vice-Chair of the Ocean Carbon Biogeochemistry committee, is the Chair of the Ecology, Evolution and Marine Biology Department at UCSB and is Co-editor of The Annual Reviews of Marine Science. His hobbies include following New England Sports, cycling and wood working.